The atmosphere was electric in O'Toole Park when Ballinteer St Johns came out on top of the Division 2 Dublin Camogie Féile after the crossbar was touched at both ends and sliotars went wide by a hairpin on many occasions in front of a huge crowd of supporters. 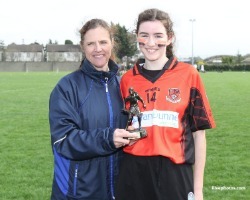 The player of the match was to a very deserving no 14 Lauren Burke who is also Captain presented by Dublin Cunty Board executive Sheena Horgan from Kilmacud Crokes who was very graceful in her speech to the opposing team to her home club. One could see from Lauren Burke's leadership on the field why she was amde Captain of Ballinteer St Johns, she simply never gave up.